Heavy rain on Friday and more forecast Saturday night and Sunday morning meant the open would be switched to the pond which we haven’t fished for a while. We had fourteen booked in so no more than a club match really and a far cry from the days when our open was a big event with 80 plus anglers from all over coming to fish, sign of the times I suppose! I must just say a big thanks to Baz Morgan who let me know what the river levels were like, Rob Cox who sent me some photos of the river and closed the pond and Jake Woodard who went down and cut peg H5 out again after the bank went in last week, it’s really appreciated. Along with some of the regulars, it was great to see Gordon and Stu Aplin fishing today and also Andy Saunders of Sharp Match Group fame who’s getting back into match fishing and was keen to win back the pound I had off him at Stathe. After another excellent bowling club breakfast it was time to do the draw and I held aloft the bucket of doom! A couple of people drew including Fieldy who pulled out fancied peg 14 and when it was Baz’s turn, I asked if he’d draw for me and he handed me number 4 which is a really consistent peg and I was happy with that. He then drew peg 17 for himself and was next door to Rob who was on 18 and would be able to check if his Wi-Fi password still worked, if it didn’t he could borrow Karl’s as he was on 19 again and I think he’s having his post redirected as he spends more time there than at home! We got out the pond and a tree had been blown down in peg 16 during the recent high winds and there was no way Leighton could fish it so we got Adie’s long handled cutter and Lumberjack Rob did a brilliant job of sawing the branches off and me and Leighton piled them up out the way. It didn’t take that long but I put the start time back by quarter of a hour to make sure we all had enough time to get ready. I finally got my kit round to my peg and the pond was very coloured although I hadn’t seen a fish top since we’d got there which wasn’t a great sign. I set up three rigs, a 0.5 gram Drennan Roach for 11.5 metres straight out, a 0.4 gram Drennan Pencil to fish by the bush on the left at 13 metres and a little Preston Chianti to fish shallow. On the side tray I had a pint and a half of casters, half a pint of red and white maggots, worms, Bait-Tech Super Seed Hemp plus some Pro Nat Fine Lake Dark I’d mixed up the night before. I got us underway at 10:15 and cupped in two balls of groundbait at 11.5 metres plus some chopped worm and caster by the bush to my left at 13 metres. Justin on my left on peg 6 did his usual and let fly with a salvo of cannonballs on his pole line before starting on the feeder. I shipped out with single red maggot on the hook and despite not seeing any fish top, I was still expecting to catch small fish quite quickly but once again the float just sat there! All the lads to my left fed their pole lines before starting on the feeder, after half an hour I hadn’t had an indication and judging by all the garden gnome impersonators, nobody was catching! 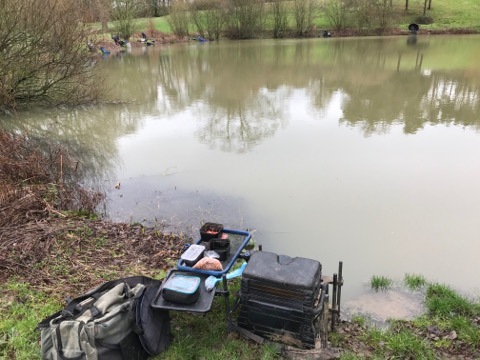 I could see Baz and Fieldy both catching small fish and apparently Terry ‘The Toast’ over on peg 20 had landed a decent fish and was in the lead at this early stage. A strong blustery wind wasn’t doing anyone any favours and I was just starting to think that we might not catch until the latter stages of the match when, with three quarters of an hour gone, the float sunk from view and when I lifted the pole, it was met with solid resistance. Loads of yellow hydro came out and it felt like a decent skimmer, I shipped back very, very gently as I knew this fish could be worth it’s weight in gold and then it fell off! I was gutted but hoped it might mean a few fish had turned up, a further half an hour passed without a bite and I had a quick go by the bush with worm but never had a bite there either, I cupped in some more chopped worm and caster and went back over the groundbait. Odd fish were now showing and I’d seen Justin, Adie and Andy S all land skimmers and it was starting to feel like I’d missed my chance! Then as we approached the two hour mark, I was on single maggot and the float went again, this time it felt like a chublet but I’ll never know as that came off as well! Next chuck, the float sailed away and I bumped a roach, this most definitely wasn’t going to plan! On a day when bites were at a premium and it wouldn’t take a lot to frame, I’d left 2lb plus in the pond! As we approached the half way point, I finally got off the mark with a small roach and I did miss a couple of bites but as I’d seen Fieldy net a better fish and Baz was still catching small fish, I’d need my catch rate to improve drastically if I was going to threaten as at least five people had landed a bonus skimmer. I did cup in another ball of groundbait on the 11.5 metre line in a bid to try and make something happen before having another quick go by the bush but it was fruitless and the wind was making it nigh on impossible to get any sort of presentation. I started getting the odd small roach on single or double maggot but was going nowhere fast so kept trying caster to see if I could improve the stamp but couldn’t get a bite on it. Justin and Adie were swapping between the feeder and pole and both were getting the odd roach on the pole while Andy W looked like he was enjoying himself as much as he had in the Xmas Fayre! With about an hour and a half left, I only had half a dozen small roach in the net but then the float started going under a bit more regularly although a few were coming off as I shipped back. I even had a couple of fish on caster but had to wait an age for the bites and the fish weren’t much bigger than those I’d been catching on maggot. A brief go with the shallow rig wasn’t the answer as I never had a bite on it. Justin added a 4oz skimmer on the feeder and I didn’t think he’d be far off today, the wind was still being a right pain and blew Andy’s hat in the pond, luckily Gordon managed to skilfully net it on the next peg. With about 45 minutes left, it was a bite a chuck, mainly small roach but I was getting the odd slightly better 2-3oz fish among them and then going into the last half an hour, I slipped a caster on and started getting regular bites. I knew I was behind the anglers with a bonus skimmer but started to think I had a chance of sneaking a section win. My clicker was reading 32 fish (all roach apart from one little perch) with five minutes to go when the float went under and I hooked what felt like a better fish, I shipped back slowly, expecting everything to go slack at any moment. 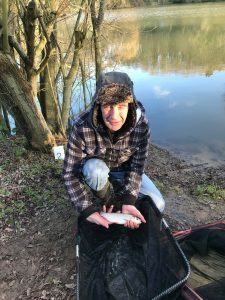 I got to the top kit and there was still a fair bit of elastic out, I slowly lifted the pole and a decent skimmer of 2lb surfaced and went in the net – bonus! There was still time to ship out again and it looked like the odd better fish was starting to show, young Stuart down on 13 had a chublet and then when I called the all out, Andy S was netting another decent skimmer, had he won it at the death? Dave P had the scales so we went down to start the weigh in with Gordon on peg 10, he had 12oz of roach and then we got to Andy S, his two skimmers and a couple of roach went 3lb 4oz and this was going to be close as I thought I had around 3lb. 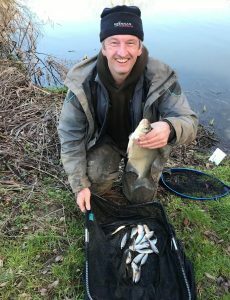 Adie had one skimmer and some roach for 2lb, Andy didn’t weigh and then we got to Justin and when he pulled his net out, it looked like it was going to be too close to call, the needle was just over the 3lb mark and his weight was called at 3lb 2oz. He was left cussing a 3oz roach that he’d missed the keepnet with, it hit the rim and bounced off on the wrong side, sometimes small margins make all the difference on a day like today (but like I say in an upcoming post, he didn’t know at the time that fish would cost him or else he’d have been more careful!). Then it was my turn and as I emptied my fish into the weigh sling, I still thought it was going to be incredibly tight but when I looked at the dial, it was nearer 4lb and Dave called it at 3lb 12oz. He was last to weigh in our section and had one chublet of 9oz, so I’d won the section and thought I might even sneak in the frame as I was paying the top four today. 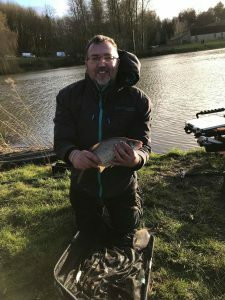 As I took my kit back to the car, the first person I saw was Rob and when I asked how the other section had fished I was amazed when he said Terry had the top weight with 3lb, followed by Baz with 2lb 10oz (all small roach), Graham had 2lb 8oz from peg 14 and Rob weighed 1lb 14oz from peg 18. Stuart had 5oz from 13 and Leighton and Karl didn’t weigh. So I’d won it! So I was really pleased to win the open again and had a nice pick up of £100 with the superpool but I’m still really worried about the fishing, that’s my biggest weight in four matches on the pond. It might well be that the conditions have played a big part in the downturn in sport but I do fear the worst and suspect predators have had a massive impact, only time will tell and I’ll reserve judgement until the summer league starts. 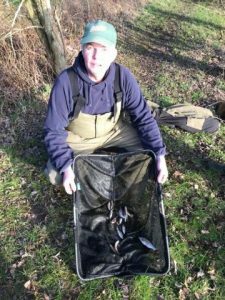 I did look at matches on the pond in February in previous years and it has fished hard at times but there have also been some good weights too. There were also a few moans about the scales again and I have to admit they’re not great for these sorts of matches where 4oz was the difference between fourth and second place, you could argue that it’s the same for everyone but that’s not really the point and doesn’t help if you’re the one that’s missed out by an ounce which is a tiny flicker of the needle, maybe wind assisted or even the angle somebody reads the dial from. Matches are won and lost and leagues decided on the weigh in, it’s arguably the most important part of the day. I think they’re fine for bigger weights but when it’s fine margins like today or the recent match on the canal, we need scales that are bit more accurate. The club has some older sets that just need servicing and calibrating so maybe that’s an option. Thanks John, I’m so pleased you enjoy my posts, my favourite articles in Coarse Fisherman magazine (and later Match Fishing) were always diary style reports by the likes of Richard Wade and Ron Lees, to name a couple, and while I don’t profess to have their angling ability, feedback like yours gives me hope that I’m getting across a similar feel which is what I always wanted to achieve. Next: Next post: The Perfect Match?